In his phenomenal bestseller, " Iron John, " Robert Bly captivated the nation with the wisdom embedded in a thousand-year-old fairy tale, creating both a cultural movement and publishing history.Now, in" Silbling Society, " Bly turns to stories as unexpected as "Jack and the Beanstalk" and the Hindu tale of the "Ganesha" to illustrate and illuminated the troubled soul of our nation itself. 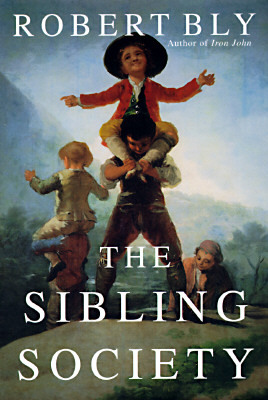 What he shows us is a culture where adults remain children, and where children have no desire to become adults--a nation of squabbling siblings.Through his use of poetry and myth, Bly takes us beyond the sociological statistics and tired psychobabble to see our dilemma afresh. In this sibling culture that he describes, we tolerate no one above us and have no concern for anyone below us. Like sullen teenagers, we live in our peer group, glancing side to side, rather than upward, for direction. We have brought down all forms of hierarchy because hierarchy is based on power, often abused. Yet with that leveling we have also destroyed any willingness to look up or down. Without that "verticle gaze," as Bly calls it, we have no longing for the good, no deep understanding of evil. We shy away from great triumphs and deep sorrow. We have no elders and no children; no past and no future. What we are left with is spiritual flatness. The talk show replaces family. Instead of art we have the Internet. In place of community we have the mall.By drawing upon such magnificent spirits as Pablo Neruda, Rumi, Emily Dickenson, and Ortega y Gasset, Bly manages to show us the beautiful possibilities of human existence, even as he shows us the harshest truths. Still, his probing is deeper and more unsettling than the usual cultural criticism. He finds that our economy's stimulation of adolescent envy and greed has changed us fundamentally. The Superego that once demanded high standards in our work and in our ethics no longer demands that we be good but merely "famous," bathed in the warm glow of superficial attention. Driven by this insatiable need, and with no guidance toward the discipline required for genuine accomplishment, our young people are defeated before they begin.It is the young and disenfranchised who are most victimized by the sibling culture, our children and out elders and those marked as "not us" by race and economic circumstance. In a phrase common to the ancient stories Bly uses to illustrate his themes, it is these people who we all to easily "throw out the window," but it is also these disenfranchised who will be waiting for us on the road ahead to claim their due.A wake-up call, an inspiration, brilliantly original, The Sibling Society will capture the imagination and enliven our nation's cultural debate as no other book in years.